Assign documents, automate renewal notifications, and focus your expert attention to where it is really needed. Collecting and maintaining vendor certifications and documentation can quickly become a full-time roll. Automate the process of notifying, renewing, and capturing necessary vendor documentation with AQA. 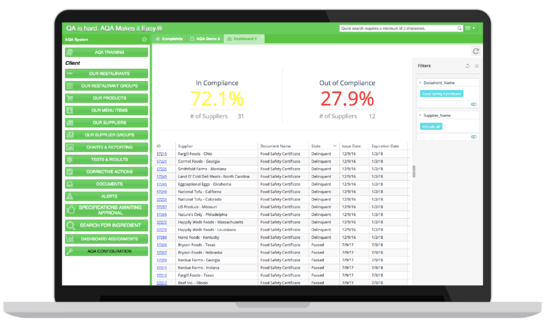 Simply login to view, at-a-glance, which vendors are in compliance as they upload their documentation themselves and prioritize your where it is most valuable - whether that's in a store or at a plant. As your vendors submit their required documentation, AQA will automatically associate each file with the appropriate record for easy access and review by anyone within your organization. 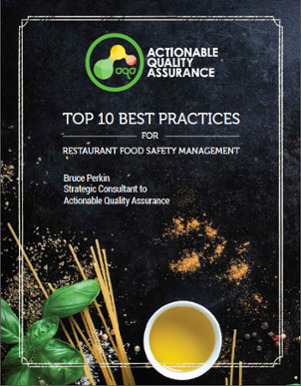 AQA’s Document Management System will increase food safety transparency throughout your supply chain and entire organization while reducing the administrative burden placed on a QA department, allowing continual product improvement and supplier management. Proven techniques to help you reduce brand risk.